* 70% less fat than USDA data for pork & beef sausage. Fat content has been reduced from 19g to 5g per 55g cooked serving. Can you think of anything tastier than sweet Italian chicken sausage? We can: Premio ABF Sweet Italian Chicken Sausage with Kale. We took a superfood and combined it with high-quality cuts of chicken and special spices to make this scrumptious antibiotic-free sausage. 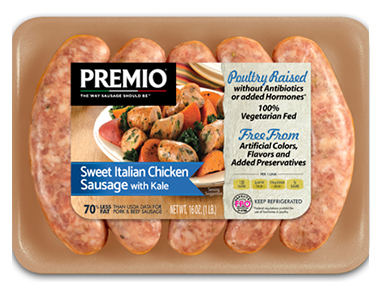 When you put Premio ABF Sweet Italian Chicken Sausage with Kale on the table, you can feel great about what you’re serving. Ingredients: Chicken, Kale, Less than 2% of the following: Dextrose, Salt, Vinegar, Lemon Juice Concentrate, Spices (including fennel & black pepper), Paprika, Natural Flavors. Stuffed in Hog Casings. No fillers. Just great taste. That’s what you’ve come to expect from our chicken sausage, offering you all the tenderness, juiciness and flavor. What could possibly make this premium sausage even more delicious? How about the addition of kale? Kale is without a doubt one of the world’s most well-known “superfoods.” It’s rich with plenty of good stuff, including high quantities of iron, vitamin K, vitamin A and tons of antioxidants. Plus, it has an amazingly wonderful flavor that perfectly lends itself to enhancing your favorite chicken sausage dishes. With our ABF sweet Italian chicken sausage links with kale, you never have to add your kale separately. It’s part of the high-quality meat you’ll serve your family. Watch their eyes light up when they bite into the best chicken sausage flavored with goodness. You’ll love making all your favorite recipes with this one-of-a-kind chicken sausage! It’s time to give yourself the gift of better health by choosing meats that are made by companies that hold traditional values. At Premio Foods, our decades in business have taught us there’s no reason to compromise. We never take shortcuts, which is why you can be sure that when you buy from us, you’re definitely getting sausage The Way Sausage Should Be™. Why make the same-old, same-old dishes for your family when you can liven up every meal with ABF sweet Italian chicken sausage with kale? We all know breakfast is the most important meal of the day. Chicken sausage makes a great alternative to bacon and can be cooked quickly on a skillet. Want to spruce up an omelet? Add slices of our chicken sausage links. The kale will come through when cooking, adding just the right temper to the sweetness of the chicken and robust egg flavor. At lunchtime, grab a pita or flatbread and make yourself a chicken sausage sandwich or roll-up. Fill it with other veggies, like crunchy bell peppers and juicy tomatoes. Don’t forget to add your condiment of choice, like mayo, mustard or tzatziki sauce. For dinner, toss chicken sausage with pasta for something different. Or make the chicken sausage with kale the main dish and serve with a baked sweet potato and veggie medley. Use your imagination, and let the chicken sausage with kale guide your cooking tendencies.